Home global World Animal Day- The dreadful condition of the animals across the world. World Animal Day- The dreadful condition of the animals across the world. 4th October is celebrated as the World Animal Day. A movement initiated by Heinrich Zimmermann to safeguard the rights of animals and protect them against human violence. Over the years He organized the first World Animal Day on 24 March 1925 at the Sport Palace in Berlin, Germany and it was in May 1931 at the International Animal Protection Congress in Florence Italy, that his proposal to recognize 4th October as World Animal Day universally, was collectively accepted and adopted as a resolution. 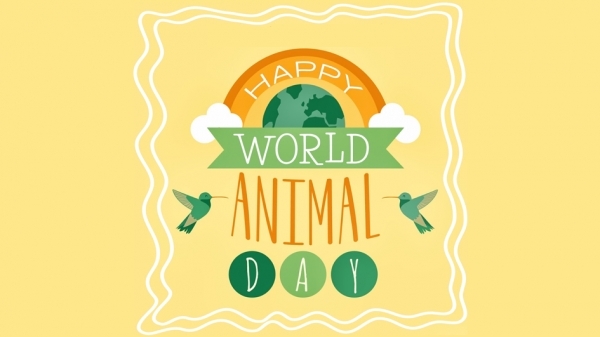 Ever since then each year this day has been celebrated as World Animal Day. The movement is led and sponsored by UK-based animal welfare charity, Naturewatch Foundation since 2003. This World Animal Day lets understand the conditions and plight of these speechless creatures across the world. Every day there are several animals that are fighting for their survival. Animals are used as property and are enslaved, beaten and kept in cages or chained for the amusement of the humans. They are mutilated and kept in butcher houses to be later consumed by the humans. Scientific experiments are executed on these animals, their skins are ripped off, and many of their body parts are sold endangering their existence. It is heartbreaking and sickening to see these animals being tortured for so many activities merely to make the human life more entertaining and comfortable. Animals are forced to perform in circus, zoos and shows merely for the entertainment and amusement of the humans. They are forced to perform hurting, baffling and demeaning tricks. Trainers use abusive tools to train them. They are starved for days, just so that they are forced to perform. Dancing Bears and monkeys- The name dancing bears is given to a trained category of bears that are forced to dance. Though the culture is banned in almost all countries of the world but yet practiced in several Asian countries. When the bear cub is only 6 months old, a crude iron needle is heated and put across the bear’s nose without the use of any anesthetics or antibiotics, and a rough rope is pulled through the thin-skinned, swollen wound. These wounds generally do not heal and are mostly infested with maggots. Male cubs are also tortured at a very young age to stop them from becoming aggressive. Not just this but to add to their miseries, when the bears reach 1 year old, their canine teeth are pulled out with a metal rod. The bears are tortured all their lives and all that they do is dance at the end of a 4 foot long rope. They lose their mental stimulations and this result in severe symptoms such as pacing and swaying. The owners barely care about the well being of these creatures. Madaris (trainers) specifically in countries like India train monkeys to dance and perform acts. They lose their freedom and tied to ropes all their lives. Tortured and their teeth are pulled out to develop fear and forced obedience in these fun loving creatures. Similarly various other animals, reptiles and birds are captured and tortured for earning money. Pet Trade and Poaching- A huge number of animal species is threatened by trade – both alive as pets or as showpieces in zoos, or dead for use in medicines. Though, the official authorities have started to protect certain species of animals like elephants, tigers, rhinos and pangolin that are killed by poachers for the trade of their body parts. But still there are many less well known species that lie under huge threat of pet trading practices. One such case is the common Tokay Gecko (Gecko gecko), which is exported by Indonesia legally. Up to three million live Tokay Gecko are exported annually and a further 1.2 million dried for its mythical medical properties. The same is true for an anticipated 160 reptile species. Around 80% of Indonesia’s green pythons (Morelia viridis) are estimated to be exported illegally. And so is the scenario of the Palawan forest turtle. The almost entire population was captured by a single group to export across the region. It is a trend of the collectors to demand for new and rare species, entire populations can be collected using academic publications to capture animals as soon as they are described scientifically. At least 21 reptile species have been targeted this way. The wild species may become extinct with such activities. To try and prevent this from happening the publications have stopped publishing the exact locations of these animals and species. Another victim of the collector’s demand is the Chinese Tiger gecko Goniuorosaurus luii). This is a rare species only known to collectors and scientists. Yet these extinct and unclassified species are easily available from traders in America and Europe, via the internet or reptile fairs. Many bird species are also under severe threat because of the pet trade. They comprise of thousands of birds in South America, and almost 3.33 million annually from Southeast Asia (1.3 million from Indonesia alone). The condition of Indonesian birds is so severe that in just one day. Over 16,160 birds of around 206 species were reported to be for sale, of which 98% were inhabitant to Indonesia, and 20% occurred nowhere else in the world. Fish have similar statistics. Up to 98% of those in water amusements parks and museums are wild caught from reefs. And almost 98% of them die within a year. As a result of this wild fish populations of species, such as the clownfish, have reduced by up to 75%. Animals are sacrificed in the name of religion or as traditional practices all across the globe. Kosher killings in Jewish tradition, owls slaughtered over superstitious fear, killing of dogs, aye aye killings in Madagascar and many such traditions lead to the butchering of these animals. Man has begun to kill animals for almost any and every reason. Some do it in the name of tradition and some in the name of fear. a religious gathering held every June 2 of the Chinese lunar calendar is a celebration of various ethnic groups such as the Dong, Yao, and Miao. Bullfighting is customary during this festival and painful. By the end of the day of this one of the bulls is grabbed, a noose is tied around its neck, and the bull is then hung to a tree until it dies. This slow and painful death is supposed to bring about a peaceful year ahead. Many such customs are prevalent across the world and we humans need to raise our voices to protect the rights of these creatures that have an equal right to live in this world peacefully. The world cancer day and all about Cancer you must know!